Now you can dine with dishes from World of Warcraft. No, really. You may not realize it, but in many MMORPGs, cooking is a skill that players can learn in the game. If you’ve always wondered how the Beer Basted Boar Ribs tasted in World of Warcraft, now is your chance to find out. Is it good or horrible? Soon you will know. This cookbook will release in October of this year, but you can pre-order it now. 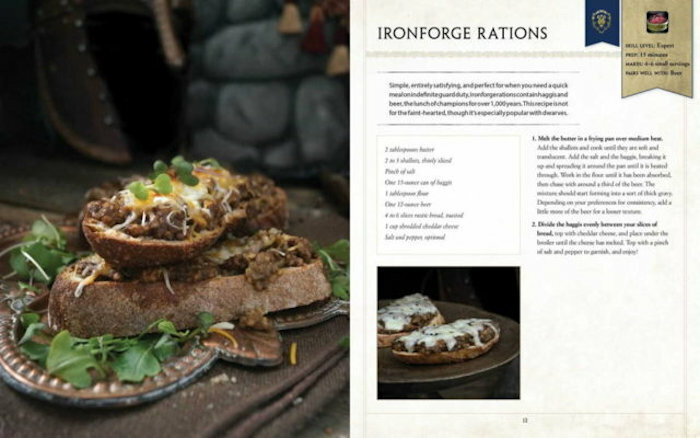 The book is written by Chelsea Monroe-Cassel who has also written other similar cookbooks, like The Shire Cookbook and From the Sands of Dorne: A Feast of Ice & Fire Companion Cookbook. She knows all about fantasy food made real. Some of the dishes actually look pretty tasty. You don’t have to be an orc to appreciate this. This will be a fun thing for fans to experiment with. Good luck with your WoW cooking.